Discover why we started the project and what we achieved so far. What are our core values and our vision. A short video to highlight the main features of the Ynibox Server. The Ynibox helps a library to implement easily digital tools. The Ynibox is a softawre who can be installed on almost any computer. It allows a collection catalogue to be accessible with a digital device (phone, tablet, computer) and helps the reader find what he wants in the documents. It allows the readers to access Wikipedia and other resources without internet access, and free of charge, on his own device. It allows the sharing of an optional internet access, implementing parental controls. It allows local users to share contents they made, with moderating mechanisms. The Ynibox is available for free and can be installed on any laptop PC computer. It requires low maintenance and can be powered by solar panel, The device comes with self training material and documentation. All you have to do is finding a name : YouNameItbox. This public library has more than 10 000 documents, including books, newspapers, DVD, CD, tablets, ereaders and laptops. It. has been updated with the Ynibox to allow users to browse the books catalog and enjoy electronic resources in a context of endemic low speed internet access. 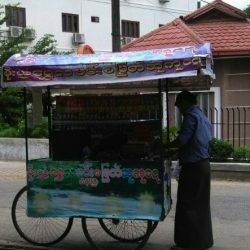 Mobile library deployed in the streets of Yangon, Myanmar. This first prototype includes 300 books, thousand of ebooks and e-resources, chairs, umbrellas and lights. It is powered by solar panel and used to create a library in a public space for a couple of hours..
Scholar library with 3000 documents, 10 ereaders, 25 tablets, 12 computers, board games, and more. Photo (c) David Clavé. Here is the document for installing the Ynibox software. Here is the documents for personnalizing your installation of Ynibox. Download the image of Ynibox for installation or live test. Alongside core and institutional partners, some other organizations have been more than helpful : Monuments books, in link with Monument Toys, donated more than 50 books and board games. Myanmar Book Aid and Preservation Foundation provided more than 7000 Burmese ebooks. The Government of Yangon Region trusted our project and allowed our library to be run during Mingalabar Festival. Thanks to their authorizations, the public will be able to discover the devices in training centers and through the streets of Yangon. French Institute in Yangon has been a key partner for developing and creating the Trishaw Books Mobile Library. Thanks to their generous trust and support, we have been able to turn our dream real. The staff is very involved in our project, including the library manager. Ynibox stands for YouNameItBox. Discover the project in the attached document.